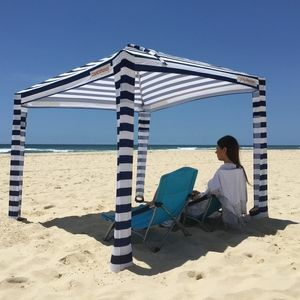 If you’ve ever been to the beach on a sizzling hot summer day, then you know how essential a beach sunshade or canopy can be. The heat can be scorching even to sun lovers sometimes, not to mention pets, kids, and coolers that will need protection from direct sunlight. Beach canopies are a good solution to your outdoor problems as they are great to use for the beach, at a tailgate, or a campsite. A good beach canopy should be lightweight, so it’s easy to carry. It should also be very sturdy at the same time, so it’s not blown away by the wind. While a beach umbrella might seem like a good alternative to a beach canopy, it can only do so much. There are many beach canopies on the market, and we have sifted through five of the best beach canopies you can get if you are planning a vacation. First on our list and deservedly so, the Cabana Style XL Beach Tent is a multifunctional, versatile canopy that is tough to beat. 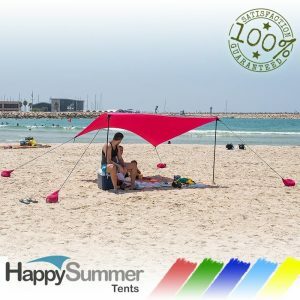 Apart from being used as a beach tent, it can also be used on lakeside activities and camping trips and is one of the unique tents in the market. There’s plenty of room inside the tent for your family and friends to stay away from extreme winds and sunshine. 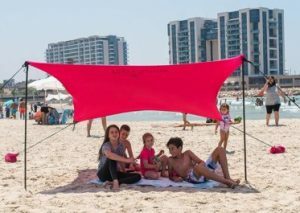 The beach canopy measures 56 square feet at its base and extends up to 4.8 feet tall along its height. Aside from its great versatility, the durability of this beach canopy is something of a marvel. The canopy is made out of 210T Polyester Ripstop, and the floor is made of 300D Oxford flooring. In addition, its fiberglass frame is strong enough to withstand anything at the beach. 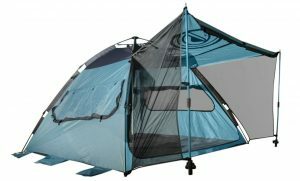 Despite having all the features, Wildhorn Outfitters still managed to make this tent user-friendly. Setting up the system is a breeze and can be done with one person in seconds. The takedown process is just as easy; you just have to follow the directions in the manual. The durability of the Cabana Style XL Beach Tent is also outstanding thanks to the quality of material used. Wildhorn Outfitters really outdid themselves in putting together this product. Not only does it protect you by the beach side but it also provides extra ways to make your time outdoors that much more enjoyable. 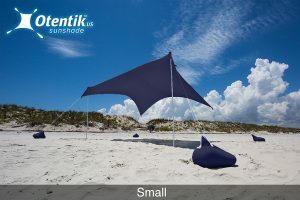 For a high quality, durable canopy that is super easy to set up, the Otentik Beach Sunshade is a worthwhile investment. This canopy particularly excels in its simplicity. While all canopies aid in protecting the user from the sun, this canopy does this in an attractive manner. In terms of size and weight, this canopy is one of the lightweight options available. Weighing in at a mere 5 to 6 pounds this canopy is not a slouch in size either. The Otentik Beach Sunshade is able to stretch to a foot area of 10 by 12 allowing enough room for up to seven people. The Eurojersey material used to manufacture the Otentik Beach Sunshade is designed to make it both lightweight and stretchable. You will be pleased to learn that this particular canopy has one of the highest UV- Protection ratings in the industry. Rated 50, this sunshade can protect you on the hottest summer days while also offering superior wind and sand repellence. The shade is super easy to set up, adjust, use, and take down. Just place the sandbags around you and secure the tie-downs to set up. Adjust by stretching the canopy fabric to desired size and shape and move the sandbags around to get maximum shade. Though it may lack many features present in many beach canopies out there. The relatively simple design and the quality of materials make this canopy durable and a convenient beach canopy for many people. 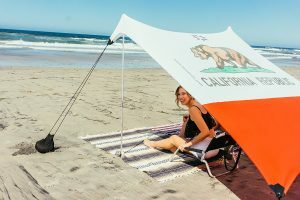 The Happy Summer Lightweight Sun Shade is a solid choice for folks who are looking for a functional and simple canopy that is still affordable. While the smallest size available is ideal for two people, there are larger sizes also offered. The sunshade comes in five bright colors and is very easy to set up. It is still able to protect your loved ones from the sun thanks to its superior UV, sand, wind and tear resistance. The tent is easy to assemble using the sandbags, aluminium poles and the stretchable high-quality lycra material. While the takedown is a bit more complicated, one person can still do it without much trouble. The canopy is very user-friendly, but its durability is somewhat questionable. The thin aluminium poles can be shaky during very windy conditions, but for the most part stay rigid enough. The Happy Summer Lightweight can still serve you summer after summer. Acknowledging all the positives, the Happy Summer canopy is a solid contender for your beach canopy this summer. The tent provides a fair amount of shade, but the included carry bag could be improved. If your vacation involves catching a flight, then you will need the Neso Portable Canopy. This canopy can easily fit in your carry-on bag. The Neso Portable Canopy measures seven by seven feet and is capable of blocking 98% of the sun’s rays. The corner design of the Neso is patented, and you’ll also love the fact that you can choose from six different colors including a stand-out flamingo pattern. The corners of the canopy have anchor bags that can be weighed down with either rocks or sand. The tent is durable enough for the beach with a two rustproof aluminium poles coupled with a high-quality Nylon/Lycra blend for the canopy material. The Neso Portable Canopy Shelter is waterproof so it should be able to protect you and your loved ones in case of a passing rain shower. Last but not least, the Pacific Breeze Easy Setup Beach Tent Deluxe has everything that you want in a beach canopy. For most tents in the market, you will find yourself making the tradeoff between portability and tent square space. This is not the case with the Pacific Breeze Easy Setup Beach Tent. The tent offers both portability and a spacious interior that can accommodate up to four adults. The Pacific Breeze comes with a carry case, sand/rock pockets, and surprisingly fast set up manual. The canopy material is made to protect you from the sun, and the Pacific Breeze does this well with a UPF 50+ rated protection. This together with its waterproofing means that you will stay put in your canopy during rain or shine. Overall, the Pacific Breeze Easy Setup Beach Tent Deluxe XL is a lightweight, easy to set up beach tent that fits up to four people comfortably. This should be comfortable enough for sun protection or even as a swimsuit changing station. 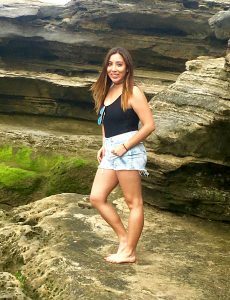 As much as you would like to be at the beach enjoying the sun, you must be aware that UV rays can be harmful to skin when exposed for extended periods. Therefore, you will need shade for protection. One of the most important factors is the size of a beach canopy and in most cases the easiest to determine. This is normally measured in the floor space covered and the height and not necessarily the size of the canopy. Typically, 10 to 12 square feet of floor space should be sufficient as long as there are no additional pieces of furniture. If you would like to add some objects under the canopy, the dimensions are an important thing to consider. The Pacific Breeze is one of the canopies with a large footage which can fit a group of 3-4 adults. Certainly, an important factor to consider refers to the ease of use while setting up or taking down the tent. The worst feeling is getting to the beach and having to spend valuable time trying to set up your tent. Many manufacturers include a setup manual with every beach canopy, but there are those that just stand out. The best example is the Otentik Beach Sunshade Original. 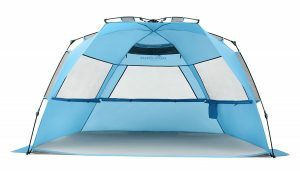 You will be able to set this tent up alone and enjoy the beach view in a matter of seconds. A beach canopy should not only be easy to use but be able to be used repeatedly. While nothing lasts forever, it’s important to check out pole construction, pole connection points, and the canopy’s fabric. These three elements work hand in hand to strengthen your canopy. One of the most durable canopies you can find is the Quick-Up Cabana Style XL Beach Tent. It features a fiberglass frame, and the fabric is crafted from 210T Polyester Ripstop to enhance its durability. Sunshine and rain resilience are an important aspect to look for in a beach canopy. The material of choice has to be able to withstand the harsh environment of the beach. The canopy will receive constant battering by wind, sand, salt, sea, and rain. Three materials that have proven to be durable, reliable and lightweight are polyester, polyurethane, and vinyl. Polyurethane has a high resistance to UV rays and is perfect for places where the sun is too hot. Polyester, on the other hand, is the least expensive of the three and holds up well against rain, as it is waterproof. The last and probably the best is vinyl, which brings durability and water resistance but can be quite heavy. Canopy design is also an important factor to consider. There are primarily three canopy designs pole, frame, and pop-up canopies. Pole canopies are of simple design and are fairly sturdy. The construction of pole canopies features poles that are supported by cords. A major advantage of these canopies is that they are easy to carry around. Frame canopies function differently. They maintain stability by use of an inbuilt frame. While they are quite difficult to move around, they provide stability and reliability once set up. Pop-up canopies are the most convenient. In most occasions, a popup canopy will require only one person to set up and will only take a couple of minutes. One disadvantage is that they are typically smaller than the other two. The most expensive canopy is not always the best. The ideal beach canopy will eventually depend on your usage, transportation distance and the number of people you have onboard. You should always check for important aspects such as the fabric material, sun-proofing, and waterproofing ability of a beach canopy. The user-friendliness, durability, and type of canopy are also important in determining what canopy best suits your style. Having all these important factors in mind will ensure a fun filled day in the sun with the right protection.